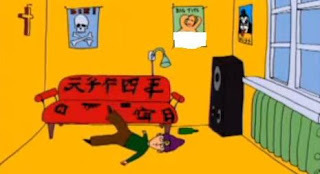 JimmyFungus.com: "Paranoid Android" by Radiohead: What the hell is going on in this video?? 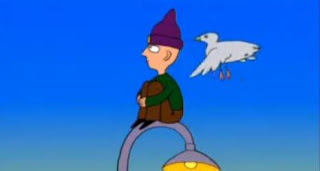 "Paranoid Android" by Radiohead: What the hell is going on in this video?? Alright, kids. Today we are starting a new segment which I am calling "What the hell is going on in this video??" 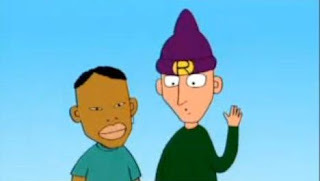 And today's subject is the classic video "Paranoid Android" by the British alternative rock band Radiohead. Alright, immediately I identify with the main character in the video, because this is how I usually start my day too. He also has a pretty nice pad...a crucifix on the wall, a Kiss poster, a nice stereo system...I blurted out the gratiutous boobage to protect the more sensitive eyeballs. I really love the main character's hat (I so want a hat like that). By the way, the "R" doesn't stand for Radiohead as many think... It stands for "Robin" which is the character's name. After a humiliating altercation in a pub, Robin climbs up on a lamp post. Is he considering killing himself, or is he trying to escape from something? Some big fat mean guy tries to chop down the lamp post, but luckily Robin is rescued by an angel in a helicopter. The big fat guy then accidentally chops his own arms and legs off. Bad karma I suppose. (This is what you get when you mess with us.) 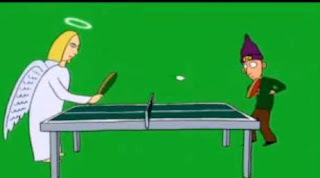 Then Robin and the angel play ping-pong. After that, there are some mermaids, and some more gratuitous boobage...and then eventually the video ends. Sooooo...in conclusion... WOULD SOMEONE PLEASE LIKE TO TELL ME WHAT THE HELL IS GOING ON IN THIS VIDEO??????????????????????????????? Welp. That will end another delightful day in the blogosphere. Once again God bless you, and thank you for your support. 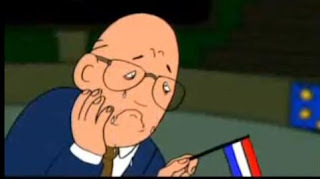 Just FYI - the flag is for the Netherlands. The colors may be the same as the French flag, but the stripes are horizontal and not vertical. Oops! Sorry about that. Thanks for letting me know. I'll fix it. what does the writing on the couch mean?